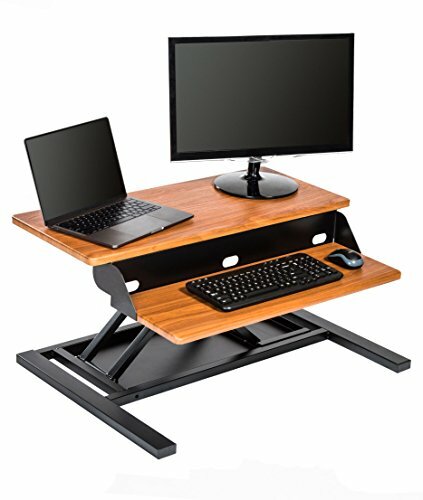 STURDY & SMOOTH MOVEMENT: The AirRise Pro is everything you want in a standing desk - smooth functionality, sturdiness, and affordability. No assembly, no hassle; simply place it on a surface and enjoy the versatility of sitting and standing. TWO-TIER DESIGN: Securely hold monitors, a laptop, or extra work accessories on the spacious 32" top shelf, while the second shelf holds your keyboard and mouse. The two-tier design ensures ideal ergonomics, placing your monitors at eye level. Upper Shelf: 32" x 13.75" x 5.25"-15.5" Lower Shelf: 27.75" x 9.65" x 1"-11.25"
AIR TECHNOLOGY: The AirRise Pro uses innovative pneumatic technology with an air cylinder that allows you to smoothly adjust heights and rise from sit to stand with a side handle in a matter of seconds. UNMATCHED STABILITY: The AirRise Pro may lift like air, but it stands as firmly as stone, with a steel structure and well-constructed base that ensures stability at all heights. Whether you're sitting or standing, the AirRise Pro is up to the challenge . HEALTHY & PRODUCTIVE: Creating a well-balanced and health-conscious environment is as simple as adding the AirRise Pro to a surface. By moving between seated and standing positions, you'll see an increase in energy, focus, and total productivity.